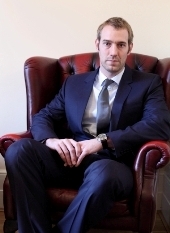 Imtaz will design an exquisite custom-made suit to your personal specification. The process of having a suit made involves one consultation, and one fitting, followed by the final collection. You can come to Imtaz's Islington studio directly, or take advantage of Imtaz's visiting tailoring service. "I cannot recommend your work highly enough, wherever I wear the suit I am always singing your praises. 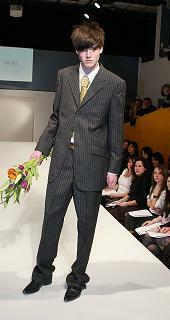 I am a fan of yours, love the suit"
"It's much more fun to come to you Imtaz in your Dalston studio than Savile Row! I have never felt so relaxed nor looked so good in any suit that I have had before." "I enjoyed our time together immensely, you are an incredible lady with an incredible story and I will feel proud to wear your suit, tailored to fit not only my person, but also to match my personality and character by a bespoke tailor who has taken the time to read, research and get a good understand of her client and what might make him tick. I can see you making the suit with the love, care and attention to detail that makes you great at what you do, not only reflecting the clients character but with the suit that comes with the wisdom of a taylor who cares about how her client looks and feels in her creation." 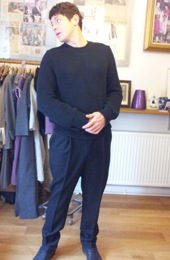 "Imtaz made me a pair of beautiful men’s trousers from scratch. Great value and service. Highly recommend!" "It’s an honour to own a suit created by Imtaz, I will be proud to wear it at my exhibitions, and moreover the christening of my daughter this year. It was a privilege to visit her studio and enjoy her lovely company. I will recommend Imtaz to everyone I know"
Imtaz was quoted as an "inspiration" by Terry during his personal and touching Honorary Professor speech at Leeds Metropolitan University (he was wearing an Imtaz suit). Terry kindly spoke of Imtaz as his "mentor and coach". "just wanted to say how pleased I am with the suit. It was my first ever bespoke suit and it is really feels great and comfortable to wear. I can never go back to off-the-shelf! They say that men make the best cooks and tailors, but I do not believe the latter now." "Imtaz designed my wedding day outfit with superb results. I allowed her complete design freedom for my Edwardian frock coat/suit. I was not disappointed. She in fact designed my wife's wedding dress as well, so the day was a real Imtaz affair, with the outfits complementing each other. She has a real flair for colour, patterns and fabric. We went through so many swatches she sourced from obscure merchants that my head swirled. But Imtaz always maintained a steady & calm resolve to not only achieve my desires, but steering me towards something she would be proud to produce. She is a joy to work with." "Thanks for my suit that's not a suit. You saved me lot's of visits to High Street outlets who would not have had what I wanted or; if they did, it would not have been such a fantastic fit, you are magic"
Richard Wale, Architectural and industrial Designs. 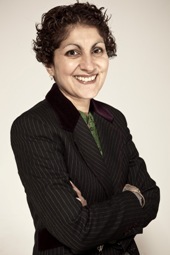 "Having been hand-made by Imtaz Khaliq in her workshop in cosmopolitan Hackney, I was recently delivered to Richard Miles, a senior banker with BNP Paribas. To be honest, Richard's no great looker, but I noticed quite a few female eyes turning towards him as we spent our first day together - you could tell that, without knowing why, they were drawn to this smart, fit-looking figure. (Thanks to Imtaz's cutting expertise, I do rather a good job of disguising the inadequacies - it pains me to say this - of his physique). My first evening was a shock. With Imtaz, I was used to mixing only with the finest materials, expertly cut. By contrast, the most charitable description of the cupboard I found myself in at the end of the day would be 'socially mixed'. One doesn't want to be a snob, but the dullness of his out-of date made-to measure suits, hanging with some very dodgy stuff apparently acquired from chain-stores, didn't make for great company. All very last-century...the good news is that I can see him sizing up some of the naffer items for the charity shop. But on reflection, although it's obvious that I've come down in the world, there's room for optimism. He's clearly a new man since my arrival, and who knows, his career might take off now. He's going to have problems fighting off the women, and that might get us into trouble - I don't want to find myself compromised - discarded and off a hanger in some girl's flat ! If he gets himself a few decent ties and can maybe persuade Imtaz to make an exception for such a non-entity and take him on as a regular customer, I think we have a bright future. As they say, outside every successful man is a well-cut suit"